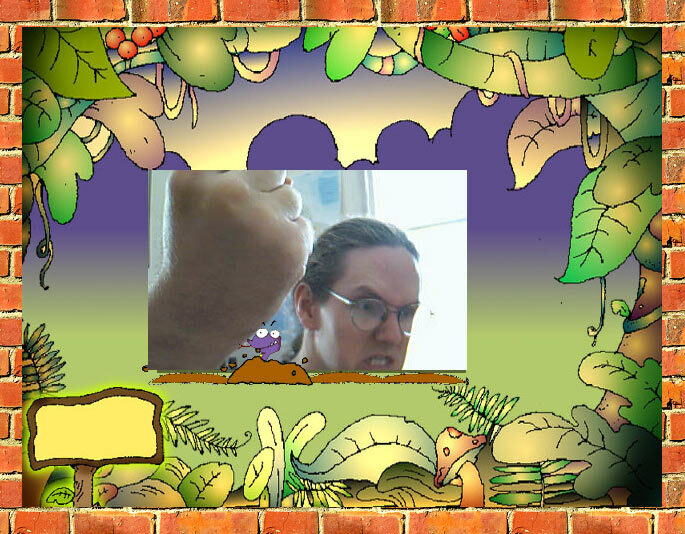 About six years ago, Dan reviewed a D-Link webcam of decidedly average quality, and eventually it fell through to me. 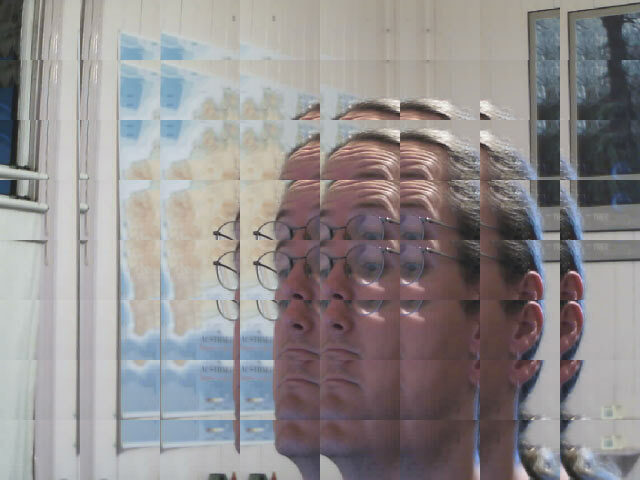 That was my first foray into the world of the webcam. As it was a freebie, I put it through the wringer over a number of years - doing some time lapse animations in lieu of actual work, pointing it out the window and letting the sun burn streaks across its sensor, setting it up to frighten unsuspecting visitors to my Web site, and finally passing it on it to my parents so we could have stuttery video chats interstate. Its successor was a V-gear Maxcam 480, with USB 2 support and true 800 by 600 resolution to match (at 25 frames per second). The V-gear's been my grainy link to the world (or rather, the world's grainy link to me) for a few years now. Like mobile phone cameras, webcams are slowly changing from Special Cameras That Take Fuzzy Out-of-focus Pictures into things that produce... slightly less crappy images. 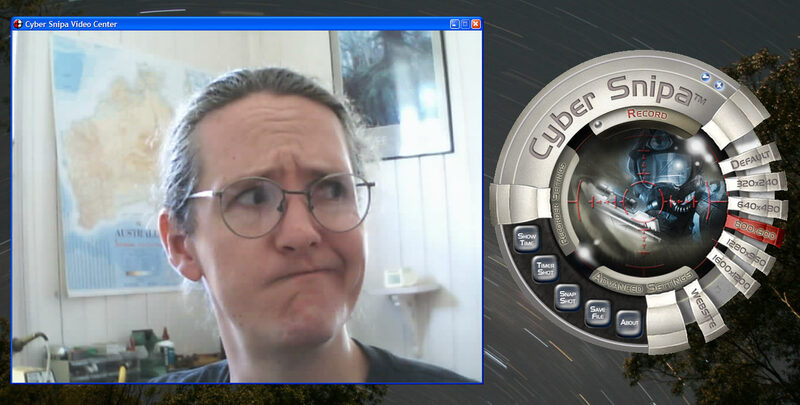 Today I'll look at the Cyber Snipa (sic) "Spotter" Webcam. I, as the more astute among you will have noticed, am not Dan. I'm Mark. Think of me as a minion of sorts. Hopefully this will not unsettle too many people. If it makes anyone feel more comfortable, I do share a general scruffy, long-haired-ed-ness with Dan. Back to the subject at hand. There are a million and one webcams on the market, and they all still pretty much stink if you want anything resembling high resolution, smooth video. I bought the V-gear because, at the time, it was one of the few USB 2.0 cameras available, and this meant that you could get a higher frame rate out of it at its maximum resolution. Nowadays there are more options - Logitech's higher end cameras are also USB 2.0 and sport a maximum real res of 640 by 480 (as opposed to interpolated software res). They will, however, set you back a few hundred Australian dollars. The Cyber Snipa offers the same resolution for a lot less - here in Australia, Aus PC Market sell it (sub-branded as a "Flexiglow" product; I think Flexiglow have invented Cyber Snipa because they felt their own brand was getting too well known) for only $AU71.50 delivered. That's only about $US54. It's also got a gimmick. It comes with a detachable zoom lens. As you can see, it's also got a snazzy-looking tripod base, to complete its rifle-scope-like image. The box contains the usual driver CD, as well as a little pouch to store the zoom lens in when you're not using it. In true Russian Doll fashion, the pouch in turn contains a tiny lanyard (of questionable usefulness for a webcam, but hey, it's free) and a yellow cleaning cloth, which, while cut with pinking shears to resemble a proper microfibre cleaning cloth, is just plain old cheap fabric. The camera itself has a rotating front section for focussing the lens. This front section also has a recessed, threaded area for attaching the zoom lens assembly. You get about 1.3 metres of cable to hook it up; of course a USB extension lead will let you extend this. There's a button and red LED on the top of the unit. The LED actually lights up when the camera is being accessed, and switches off when it isn't, which is nice. I've seen plenty of webcams where the light is on all the time; it just means that it's plugged in and has power. This is good for feeding your guests' paranoia, but for little else. The button on top is the usual "perform an action" jobbie. By default, the first press on it fires up the fabulously unintuitive (but still useful) "Amcap" program, and subsequent presses capture still images using a thing called "Vmcap". It then lets you save the captured images in any format you like, as long as it's as a BMP. The little tripod supplied with the Spotter is probably the least substantial tripod I've ever encountered. 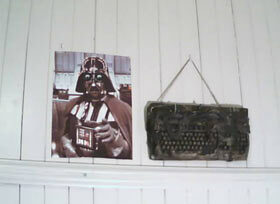 This includes the similar-looking cheap and cheerful fellows you can pick up for your pocket-sized digicam. 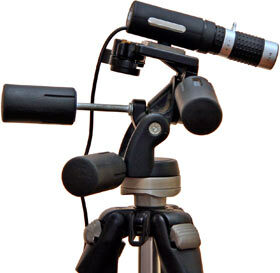 The tripod weighs very little, and has sturdiness to match. That said, its job is to support a webcam, so military grade industrial engineering isn't exactly called for. 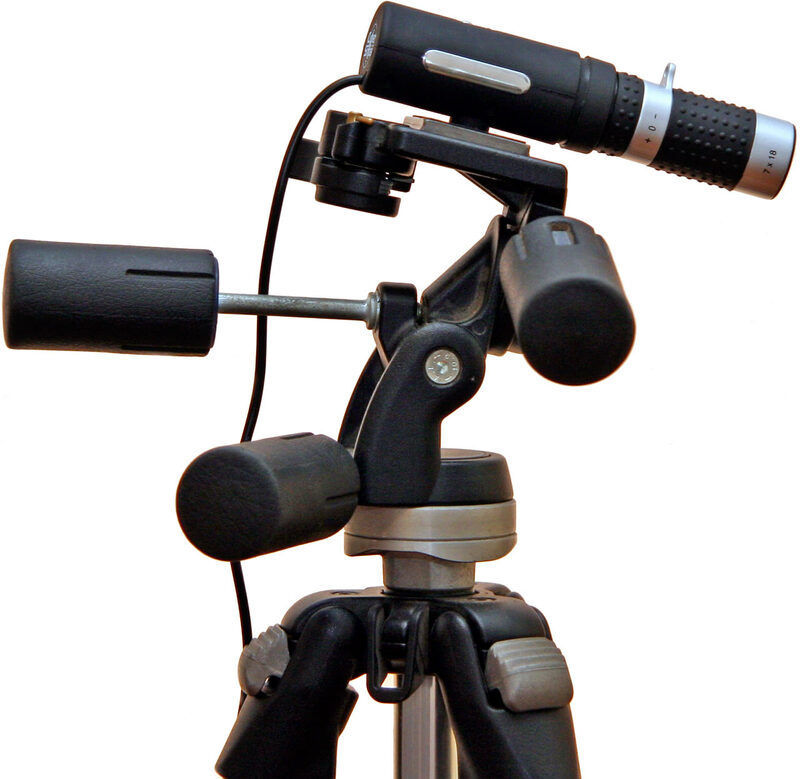 Neatly enough, the mount on the weeny little tripod is actually a standard tripod screw. The good thing about this is that it means the camera itself can be attached to any other sort of tripod you like. The bad thing about this is that it means the weeny tripod will screw straight into any other camera. Including my EOS-20D DSLR. This is bad because, given that I could, I did. I carefully screwed the tripod into the base of my 20D, which also happened to have a monstrous flash on it at the time, and placed it carefully on the table. There was a crunch sound, and the legs folded out flat. It turns out that some of the shiny parts on the Spotter's tripod aren't cheap pressed metal after all; they're even cheaper plastic covered with metallic paint. The single screw securing the leg assembly to the head assembly simply tore off its plastic mount. Of course, this is unlikely to ever become a problem with just the webcam sitting on it. If you accidentally leant on it though, no doubt something very similar would happen, so don't do that. Cyber Snipa proudly proclaim in the documentation that the Spotter comes supplied "with detachable 7 to 18 times zoom lense!" (sic; they've fixed it on the product page). I'm not entirely sure what they mean by that (and I'm not just talking about the spelling). The implication (for me) is that the zoom is adjustable from 7 to 18 times, however, there isn't a way of zooming the thing at all. It's either screwed on to the camera or it isn't. 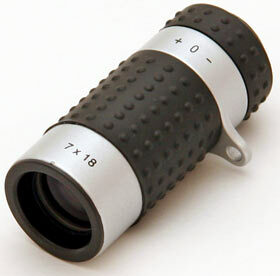 The lens does have a black studded focusing ring of its own, which you need to use to get any sort of image out of it. It also has a second, larger black studded area, which would appear to be where one would expect a zoom control to be. But it doesn't move, and in fact it's just a ring of rubber over solid metal, designed to look cool. In strict photographer's terms, this makes it less of a "zoom" lens, and more of a prime lens. But we're splitting hairs over definitions. Attaching it "zooms" the image. It's just not an adjustable zoom. And now the image from the same spot with the zoom attached. 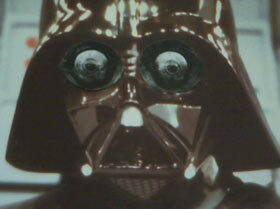 As you can see, Googly Darth gets a lot closer. A piece of Canon "L" glass this is not, but it does its job reasonably well. It's a bit of a bugger to focus, so your best bet it to set it and forget it. Also, the minimum focus distance when you're using the zoom is pretty large - about a metre - so you're not going to be using it as a macro lens. 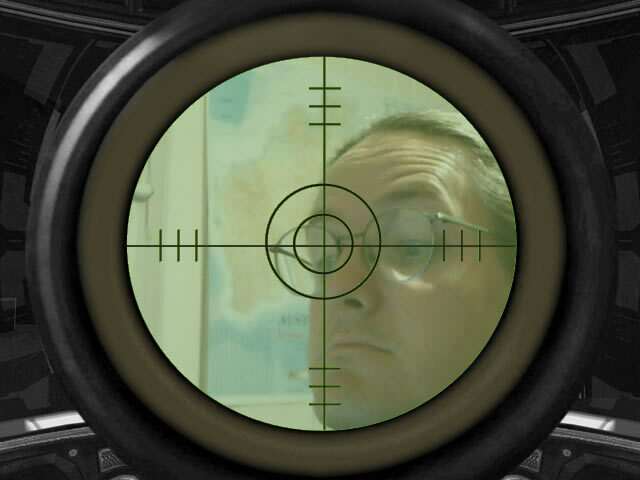 Overall, for what it is, the image quality of the Spotter is pretty good. There is a fairly noticeable amount of softness in the image, but for a cheap and cheerful webcam it's acceptable. The Windows drivers adjust white balance quite quickly, and the Spotter performs quite well in low light - but it achieves this at the expense of frame rate. This trick has been used in the past on everything from proper video cameras to mobile phones. You simply increase the exposure time and drop the frame rate accordingly. Given that most online video chats are pretty damn stuttery anyway, it's not so much of an issue. Just bear in mind that you won't be shooting any documentaries on Australian nocturnal marsupials with it. One thing that name brand webcams have sometimes had over not-so-name brands is that their bundled software and drivers are somewhat less sucky. My V-Gear camera came with something called "V-Gear Bee", which purported to be the greatest software nexus of webcammish activity ever, but which in fact turned out to belong in the proverbial Neil Young song. In some ways, the Spotter continues this tradition. Its basic driver is installable separately though, so you can use the camera with the likes of Skype, MSN Messenger and so on without having to install anything else. 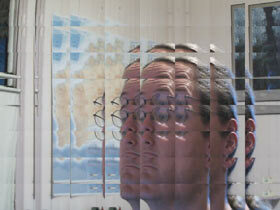 Included as a part of the driver is the ability to apply various software filters to the webcam's output. You can make you image appear black and white, sepia, as a negative, pixelated (to various extents) and distorted in a number of ways. 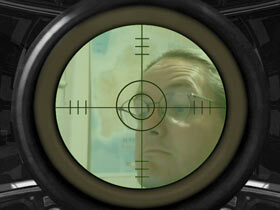 You can also apply various frames and overlays to the image, for example the sniper scope below. In addition to the driver (which also supplies you with Amcap), the CD contains one of the many versions of DirectX 9.0c, and two other software packages - the Cyber Snipa Video Centre, and a package called VP-EYE. Surprisingly, and despite having a fairly custom feel to it (hence my dubious look), the Video Centre application is actually OK. The Video Centre lets you preview the camera output in various resolutions, both real and imaginary (software interpolated). You can also save snapshots and record video. In theory, you can specify which audio device to use (as the Spotter doesn't have a microphone of its own built in), and which audio and video codecs to use for compressing the data. During my limited playtime, I couldn't get the recorder to work satisfactorily. But my Windows install is fairly elderly now, and there are codecs a-plenty floating around on my hard drive that no longer work the way they should. Generally speaking, you'll have better results using Amcap. First, record the video straight to an uncompressed AVI. This will be huge, but hard drive space is cheap. Now, use your favourite compressor (like VirtualDub) to post-process it. This way you can control the file size and crunchiness of the final video to a better extent, especially if you go all fancy and two-pass it. The Spotter's other software, VP-EYE 4.0, is the usual webcam fare. It's several years old now, and it shows. It seems fairly richly laden with functionality, but of a dubiously useful nature. One example is the included suite of games, one of which is a Whac-A-Mole game that you play with your hands. Alas, despite slamming and thumping the air vigorously, I was not able to consistently whack moles. All up, this is a good little webcam. Well, maybe not so little - compared to some of the clip-on laptop cameras, it's actually quite large. The tripod, while flimsy overall, is fine for its intended purpose. It also gives the camera quite good stability; many webcams I've used in the past have had an irritating tendency to be pulled around by their cable, especially if you hang them up high. The Spotter doesn't suffer from this problem. The "zoom" lens is a novelty, but it does work. It's very susceptible to bumps and small movements, though. Personally, I'd like more wide angle in a webcam - many of them, Spotter included, have a fairly narrow field of view. Perhaps I'm unimaginative, but I couldn't think of terribly many uses for the "zoom". The first two I came up with were security, and voyeurism. Given the Spotter's respectable image quality, it's pretty good for a cheap and cheerful CMOS camera. 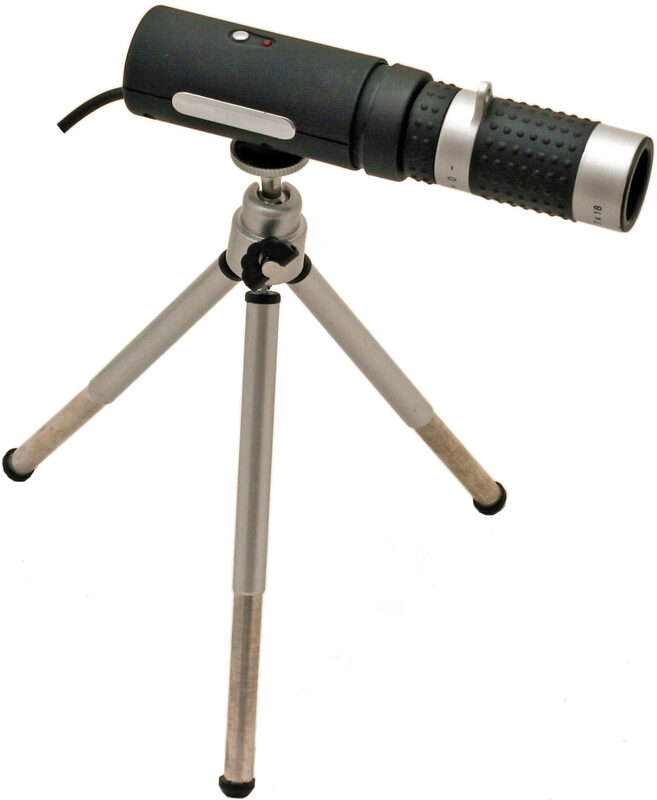 The Cyber Snipa Spotter is $AU60.50 delivered from Aus PC Market. Australian shoppers can click here to order one.